Geraniums are expensive! They can be found in most garden centers during the spring and early summer, but once the frosts come, they're done. But wait a minute! They're perennials, which means they can live for a long time with the right care and conditions. They can't take any frost, so indoors in a cool basement with some light, and only a little water. That can be difficult to supply, sometimes. This method must be done before frost. When using this method it sometimes takes quite a while for the plant to begin to grow, once you have planted it in the spring; so you will need to decide when you have waited long enough. For example……I have had plants that have taken 5 weeks before they have shown any signs of new growth and sometimes when I have gone to take the plants out of the bags they have already started to grow…..and sometimes when I have planted a plant it has never grown. So this method is not my preferred method – but it does work. Probably 25% success rate. In the fall before the frost remove plant as carefully as you can from the pot. Shake off as much dirt as possible making sure that the roots are exposed to the air. Remove all flowers from the plant. If you want to keep certain colours together then indicate the colour on the outside of the brown paper bag. Hang no more than three plants in one large bag. Tie a string around the plant right where the roots start. Turn the plant (s) upside down - placing green part (flower end) inside the bag with the roots outside the bag. Then close the bag somehow around the plant (s). Sometimes I have stapled the bag a few times to ensure that the plant stays in the bag. Hang the bag in such a way that the roots of the geranium are out of the bag. In other words the roots must not be inside the bag – they must be exposed to the air. Then find a cool, dry, dark place to hang the bag or bags. ** They must be hung away from light. My Mum used to hang them in a dark basement so light is not important with this method. ** About once a month go to each bag and spray the roots with water. Give them a good spray touching all sides of the roots. ** The plants will begin to look like dried up sticks…this is normal. Prepare your pots as you normally would but include fertilizer granules. The product I use is Miracle-Gro Shake ‘n Feed. 12-4-8. I have used it for years and my flowers are lovely. Place them in direct sunlight and give them a good soak of water. Then water them about every three weeks after that. Do not over water them or the roots will rot. If there is a threat of frost move the pots into a protected area. ** I have a long cement wall between my cabin and the lake I live on. When I am ready to plant my geraniums, I prepare everything as I mentioned above and then I leave my pots outside on the wall and let them get as much direct sun as they can. I leave them on the wall until I see they are well on their way with the first bloom showing. Only after that do I start placing them in different areas around the property. Reason – I want them to get the best start they can – and the direct sunlight in the spring is what they need. This is my preferred method of winterizing. From my experience plants that are in bigger pots do better than the ones that are in smaller pots. The reason being is because smaller pots need to be watered more often. 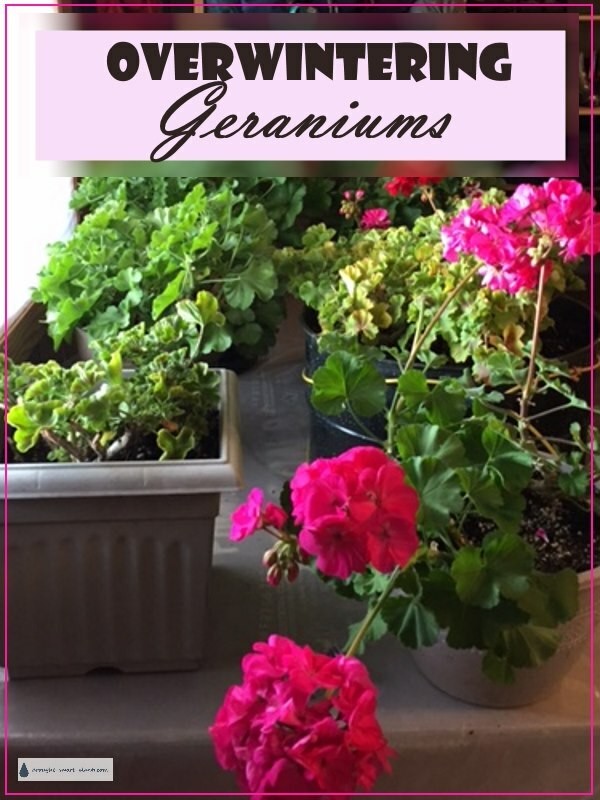 So if you have pots that have only one geranium in them - water them once a month. Large pots with two or three geraniums in them can be watered approximately 3 times from October to April. Don’t over water!! Or the plants will rot. I winter about 45-50 plants (smile) so the larger quantity is reflected in my instructions. Preparing my plants for the winter is always a very sad day for me. It just doesn’t seem right that I am putting them away in the basement when they are absolutely gorgeous!! But in order to save them I have to prepare them well before any hint of frost. Carry all pots close to where you are going to store them. This is best done outside as there is quite a bit of plant debris to be removed. I also stop watering my pots a week or two before I plan to winterize them…..that way they are not so heavy to carry when the time comes to prepare them for the winter. Have a garbage bag ready for all the flowers etc. you are going to remove. Label the pots so that you know what colour geranium is in the pot. If you are taking geraniums out of one pot and putting it into another – just prepare the new pot and then when you take the geranium out of the old pot try to keep as much of the original dirt around the roots as possible. Remove all flowers and any buds that might not yet have opened. Now – carry your pots to where you are going to store them over the winter. I have a basement with minimal heat and they love it there. I also kept one plant in my entrance way that has no heat register but there is light, and I have kept a few in my kitchen. 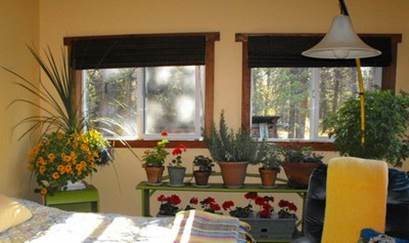 So depending on how many plants you have will determine where you plan to store them over the winter. Place your pots in a lighted area. Plants do not need direct sunlight but they do need light. Give each plant a good drink of water so that it runs right through the pot. From November to April I give each large pot water 3 times and smaller pots with only one geranium I water once a month. ** Remember don’t overwater or the roots will rot. You will be surprised at how green the plants remain and also that they may even continue to bloom. The ones that I keep in my basement bloom all winter. 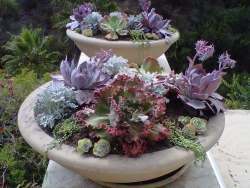 In the spring when it is frost free carry each pot outside and place it in direct sunlight. Give the plants water so it runs right through. Take each plant and cut it back so that only 4” of plant remains. Everything else gets cut away and all you have is the base of the plant remaining. Each pot needs the top of the soil turned or worked so that you can add Miracle-Gro Shake ‘n Feed 12-4-8. You may also need to add additional potting soil so that the plants do not dry out as quickly over the summer. Also, over the winter the soil tends to settle in the pot so make sure you loosen the soil as deeply as you can without disturbing the roots. Because the temperature is still cool they don’t need a lot of watering so monitor watering yourself. I probably water every 3 weeks – just depends on the weather. As I mentioned in the brown bag method *above* I have a long cement wall between my cabin, and the lake I live on. When I am ready to plant my geraniums I prepare everything as I mentioned above and then I leave my pots outside on the wall and let them get as much sun as they can. I leave them on the wall until I see they are well on their way with the first bloom showing. Only after that do I start placing them in different areas around the property. Reason – I want them to get the best start they can – and the direct sunlight in the spring is what they need. Note: These plants will not bloom as quickly as the ones you buy so be patient – when they do grow they are very strong and healthy and it is so rewarding to see them come back to life. Hurray you did it – now you will feel a real sense of accomplishment when they start blooming. Aphid treatment – I have used soap and water on my plants but it is not fool proof. Get your garden hose and turn it on. Hold your hand at the back of the plant so when you are spraying the stock you do not bend it. Spray the water on the plant with as much force as you can from all angles. So in fact you are spraying with full force water through the plant blasting each stock where the aphids might be. Over the winter some of my plants got aphids on them – so this past spring I did this when I first put the plants outside, after I cut them back to 4” high. Then a week later I did it again. I never saw another aphid after that. However keep your eyes open – remember all it takes is one aphid. If you have aphids on your plants in the fall, I would do the same thing. Blast them with water full force. Reason - the last thing you want is aphids on your other indoor plants. So if you are going to be bringing your geranium near other plants perhaps have a little “incubation” area where you can watch them for a few weeks. If they have aphids on them, you either spray them or throw them away. The last thing you want is aphids on any of your other plants. If you follow Carole's clear instructions, let us know how it worked out. 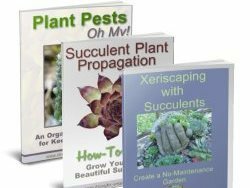 Maybe your method for success will be slightly different, as we all have unique conditions, but this will give you some idea of what geraniums need. 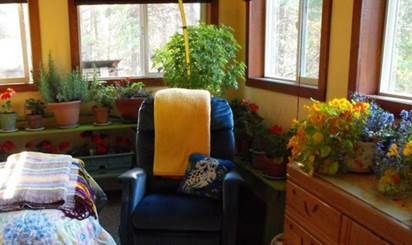 Rosemary was the recipient of some of my geraniums at the end of the summer, and she set up her bright bedroom to be their home for the winter. Here are a couple of shots of the growing area - when the nights close in, she'll be installing some grow lights. She's also trying to overwinter Nasturtiums and Lobelia - they may make a nice show for a while, but anything you bring in from outside must be treated for hitchhikers. Rosemary (the plant) is a good candidate for overwintering too.